The following blog is the fifth in a series of eight examining Current Trends in the Opto-micro-electronic and RF Packaging Eco-systems giving readers a glimpse of our shared technological future, as well as hints regarding Palomar’s product development roadmap. This one deals with the rapid changes in commercial dynamics/market drivers in the opto-micro-electronic and RF packaging sectors. The views represented are entirely those of Dr. Anthony O’Sullivan Palomar Technologies Strategic Market Research Specialist. Dr O’Sullivan will gladly field questions and comments. 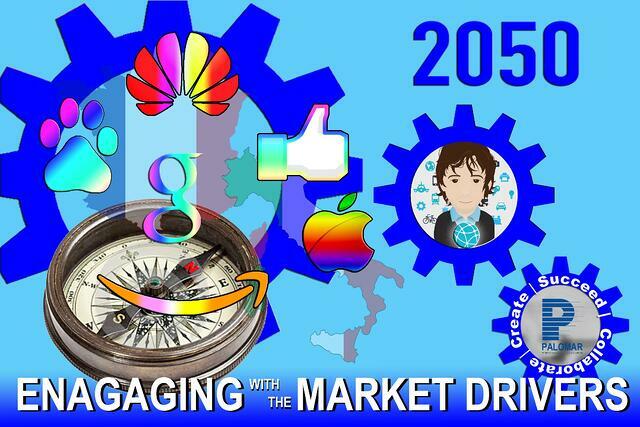 #5 Engaging with Rapidly Changing Market Drivers. In a previous blog, we noted that the top six largest web/datacom companies have, at over US$ 4 trillion, a corporate worth more than France and Italy combined. The decisions they make, and subsequently drive forward, determine the core market parameters for everyone else. In short, a few dominant players mark the “true north’ for the market, including the many smaller sectors that support it. Selling into any market requires strategy and engagement, yet the “step-up” here is so great that these verbs are inadequate. Those who wish to engage in this sector must attain synergy: Listen carefully, engage more carefully still, and then align themselves—not just with commercial practice and technology—but with an entire ethos, that of the, “Millennials”. The fresh face of Mark Zuckerberg is not a “flash in the pan” but definitive of a new kind of executive, who through passion and vision, takes consumer-shaping businesses into a bigger future. In our reference to “Millennials” it would be to miss the point to see this as merely one generation giving way to its successor. This is not about the baby-boomers or Generation X “passing the baton”. This is about world-views, a first order culture change of the type that produced the first Industrial Revolution. “Millennial” culture is human-centric, positive, visionary, agile and rapidly becoming mainstream and it must be embraced. Though short-term survival may not be at stake, growth, success and long term presence in the market, certainly are. Whereas twenty years ago the loss of one “big” company order had the “upside” of allowing failure to lead to small changes in tactic, and then recovery, this is far from the case today. Commercial failure in this sector suggests big internal shifts are required. In 2017 one multi-billion dollar company lost fully half its corporate value—not so much because they were making the wrong product at the wrong time (though they were), but rather because they drifted out of alignment. Had they been attuned, engaged, agile they would have been preparing for what would be in demand. Conversely, anyone reading investor reports will be struck by just how many multi-billion dollar companies have been “made” by winning a contract with one of the “big six”. This was not down to luck, however. These companies not only pro-actively crafted their foundations for success, and did so in a spirit that dovetailed perfectly with the new Millennial ethos. Some readers will be familiar with what I have outlined, others not. Either way, less awareness surrounds the exponentially growing impact of geo-political shifts and governmental decisions. For example, legislation is in place in many European countries (and elsewhere) that effectively spells the end of diesel and gasoline. Equally, financial and other incentives are in place to push the adoption not only of electric, but full-on autonomous drive vehicles (cars, trucks, trains and transport drones or pods). The UK, Germany and France all announced billion dollar infrastructural investments to prepare for them. Those working within the LiDAR industry (one of the enabling technologies), are acutely aware of significantly rising demand for their products. On the flip side the wealthy states of the middle east are investing trillions of dollars in developing post-oil, extremely high-tech, economies. As with electric vehicles and autonomous drive, government action has brought forward both 5G and the wireless infrastructure upgrades which will provide its backbone, 4.5G and of 4.9G. Earlier media cynicism has now given way to “Sooner than we expected.” In parts of Korea and Singapore, 5G is already here. They will be joined by selected cities in the US, Australia, China and Germany before the end of the year. At the end of 2019 they will be joined by Australia (nationally), Mexico, Chile and Argentina. Twelve months later by many more countries including China, the US, Canada, the UK and Germany. Significant increases demand for opto-electronic and RF products will become even larger. Most important of all these market shifts are aligning to markedly bring forward the development of photonic-on-package technologies and very similar advances in RF GaN packaging. Concerning the latter, we can add the development of diamond, silicon carbide and silicon substrates. These GaN technologies are of great interest to national governments, not least because of their applications in defense and security. Current estimates suggest around US $2 trillion of public/private money has been lined up for research, development and other investment over the next decade. 1. Determining the technological direction and tempo of research. 2. Setting the timeframe for others’ new products/processes. b. Creativity, agility and responsivenes. c. Stronger relationships founded on Millennial values. Together, these shifts represent big challenges to maintaining market engagement. That having been said, most readers will resonate with the vision. Certainly Palomar’s employees are eager to deepen customer engagement, adopt more holistic approaches to collaborating on solutions, and doing what ever it takes to support our customer’s leadership in their respective fields of excellence.